Our apartment is fitted to the highest standard with a fully fitted kitchen, air conditioning, internet TV with full UK channels, SKY and SKYSPORTS + over 2000 free movies, CD and DVD, two bathrooms (1 en suite), sun loungers, BBQ and dining terrace. 22Mbps unlimited Wi-fi internet access. There are 2 bedrooms with the option of two further portable beds in the living area, suitable for children. 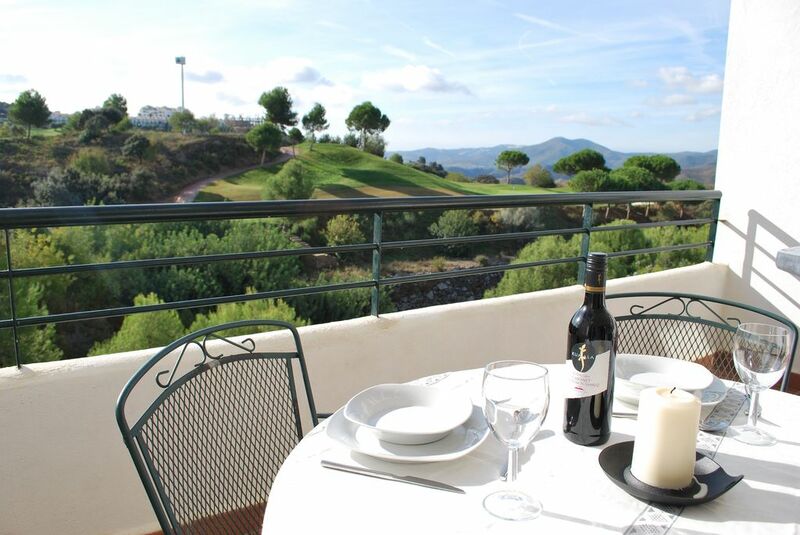 Occupying an incredibly quiet and peaceful location with stunning views from the dining terrace over the 6th green of the Alhaurin Golf course out to the spectacular Sierra Nieves (see photos). Located on the unique Seve Balesteros designed golf course (with driving range and a par 3 course), the location also offers over 40 courses within a 1 hour drive. There are many activities for families too, beaches (20 mins), communal pool, horse riding, cycling and many beautiful mountain walks. Alhaurin is a quaint white-walled town which has a lively night life. Malaga airport 30 min. We live just outside Chichester, UK and are both keen cyclists, spending weekends cycling the South Downs with local clubs. We have owned the apartment in Spain since 2004 and love escaping the British winters to enjoy some sun, relax and cycle the stunning routes through Andalucia. This is an ideal place to relax, quiet and with beautiful views and stunning scenery. It has something for all the family. Great weather, amazing all-year cycling, beaches, restaurants, golf, culture and authentic Spanish night life. It is also close to the historic towns of Seville, Cordoba and Granada. The location is ideal for the beach which is only 15 mins away, but also within a two hour drive of Seville, Cordoba and Grenada and the incredible Alhambra Palace. But mostly we enjoy relaxing by the pool, on the beach or soaking up the evening sun with a glass of wine and a BBQ on the apartment's balcony. For the more energetic there are picturesque walks, 40 golf courses, some classic on road and off road cycle routes, horse riding and tennis. The Apartment has everything you will need to make you feel at home, including satellite TV, Wi Fi, DVD and a fully fitted kitchen. Towels and bedding are also provided. You will need a car and these can be hired relatively cheaply from the airport. 2 bathrooms: En-suite luxury bathroom to bedroom 1 with double basin, bath/shower, wc and bidet. Separate bathroom with bath/shower, wc and bidet. Free, unlimited dedicated wifi 22 Mbps + internet TV with full range of UK and Sky channels. Large living room/dining room, tastefully furnished in Andalusian wrought iron/glass with 2 comfortable leather sofas, dining area, sideboard, Internet TV, DVD and CD. Opens out onto the dining terrace. Fitted kitchen with electric 4 ring cooker/oven, microwave, dishwasher, washing machine, fridge/freezer, toaster, kettle and double sink. Internet TV package includes full range of UK channels + SKY, SKYSPORTS and over 2000 free films. Beautiful communial gardens with ponds, waterfall and terraced lawns. Located on the prestigious and unique Alhaurin Golf course, designed by Seve Balesteros, which also has a driving range and par 3 course. 40 other courses within 1 hour drive. Notes on accommodation: This is a beautiful, comfortable luxury apartment, equipped and meticulously maintained to a high standard. Regularly used by the owners, family and friends. Outside: Two ground floor terraces, one overlooking the pool, gardens; and the second (dining terrace) with stunning front line views over the golf course to the Sierra Nieves Mountains. BBQ and sun loungers. Spacious private penthouse roof terrace. Landscaped communal gardens with lawns, waterfall, ponds and a large communal pool. Sun recliners are provided. The complex is very quiet and peaceful, even at peak times. Ideal for relaxing. Cleaning / Towels / Linen / Maid service: Towels and linen are supplied and laundry is included in the price. A mid-stay clean can be arranged (40 euros). We have a local agent who is on hand to deal with any queries. fantastic apartment with everything you need. Top class customer service from the owner with nothing too much trouble. Apartment spotless and very safe with fantastic views of the golf course. oh how i miss my morning coffee sat in the sun letting the world pass us by. worth having local taxi number as bars are a good walk away but possible. nearby bar The boma food and drink, los candiles restaurant steak house fantastic food. there is also a club house that does food and drink on the complex. My husband and I spent 5 week in the apartment cycling through orange and olive groves, golfing, hiking, and touring around. The apartment is good-sized, very comfortable, clean and well outfitted. We cooked often in the fully equipped kitchen with large fridge and freezer. The dining terrace is well positioned for sunny leisurely breakfasts with beautiful views of the surrounding hills. The roof terrace is large and very private. The communal grounds and pool are very nice, clean and well taken care of. The location of the apartment is for those looking for a quieter location within a short drive to busier more touristy costal areas. The closest town to the apartment, Alhaurin el grande, is a working town offering good authentic restaurants and small food shops. The owner, Malcolm, was very helpful in providing us with road biking routes and places and restaurants to visit. Malcolm's bike cage in the underground parking garage was very convient for storing our bikes. We highly recommend this apartment for a get away. We are delighted you enjoyed the apartment and surrounding area. Thank you for the review and we hope to welcome you back again at some point in the future. Modern, spacious, well equipped, comfortable with excellent views and a scenic swimming pool. This was my third visit to the apartment and Sandra's first. My impression of the surrounding Andalucian countryside, cultural hot- spots and authentic food only grows with each visit (and that's without mentioning the miles of sandy beaches and warm sea). We cycled in the mountains for several days of our stay and the scenery is varied with olive groves, almond and orange trees in the lower slopes and rugged mountain tops. The Spanish roads are generally very smooth and the drivers treat cyclist with more respect than I've ever experienced in many years of continental cycling. We had some wonderful impromptu food when we stopped in small villages which way exceeded our expectations. Look out for the lovely view from the square at Casarabonella and the houses built into the limestone in Setenil. The walk at Camino Del Ray has rightly won some tourism awards for it's vertiginous walkway clinging to the cliffs of the gorge, giving access to sights that most of us would never get to see. Cordoba is likewise a beautiful City - try the Turkish baths for a sense of what it might have been like as a Roman seeking some serious RnR. Overall a really great holiday location either for day trips or staying put by the pool with easy access to Deja and Marbella.... We're very much looking forward to our next trip! Lovely apartment in a very good location giving easy access to the mountains as well as the coast. The roof terrace with its stunning mountain views is the perfect place to enjoy a meal in the glorious sunshine. There is a nice pool with beautiful gardens to enjoy playing and relaxing. Had a great stay and would highly recommend it. Stayed in the apartment with 3 friends all cyclists - the apartment is fabulous, very high standard of fixtures and fittings - the block is very clean and well serviced with a great secure car park. the swimming pool and area is also very good. This area is great for cycling close to mountains and the beaches (and golf of course if you're interested). 20 mins drive to the beautiful beaches of the Costa del Sol at La Cala de Mijas, Cabopino etc. Free parking. Alhaurin el Grande is around 30 mins drive from Malaga airport. We recommend you hire a car from www.malagacar.com. Alhaurin el Grande is around 3Km from the apartment along a dedicated walkway/cycle track. It is a bustling, traditional Spanish town with a wide range of facilities and shops. Alhaurin el Grande 3Km. La Cala de Mijas 15 min. Seville 2.5 hrs. Cordoba 2 hrs. Grenada and the Alhambra Palace 2 hrs. Marbella 30 min. Antiquera 1 hr. Ronda 1 hr 15min. Gibraltar 2 hrs. As well as golf, the location is ideal for families. Horse riding and pony trekking across the sierra, cycling and mountain biking (hired locally), many wonderful beaches and some stunning but easy walking in the high sierras overlooking the coast. Andalucia offers a unique cultural experience, sample local wines in the white, walled village of Ojen, follow in the path of the Romans at Ronda, or explore the awe inspiring Islamic palace at Alhambra. Visit the spectacular Gorge del Chorro or enjoy local food and Spanish life in one of the many nearby authentic white Andalucian towns. There are two restaurants, a cafe and a small shop within a 5 minute walk. Booking Notes: 25% deposit to confirm booking. Full balance to be paid 2 weeks prior to holiday. Electricity is charged at cost (to avoid huge aircon bills in the summer). This is normally around 25 euros per week. Changeover Day: Flexible. Notes on prices: Long weekends and short stay rentals available - prices on request. Electricity charged extra at cost, this is a minimal cost providing the air-conditioning is used responsibly.